Researchers in Spain have unearthed a bizarre dinosaur fossil with a massive "sail-like" structure on its back. Scientists continue to dig up the remains of creatures that once roamed the Earth millions of years ago, and as a result, our understanding of the history of life on our planet becomes clearer. That doesn’t mean that we know everything, however; scientists are constantly surprised by some of the fossils that come up out of the Earth, and the latest discovery in Spain is no exception. According to a report from Reuters, a massive herd of dinosaurs with a strange “sail-back” structure roamed the grassy banks of a river that ran through the countryside. Researchers believe the creatures lived during the Cretaceous Period, roughly 125 million years ago. 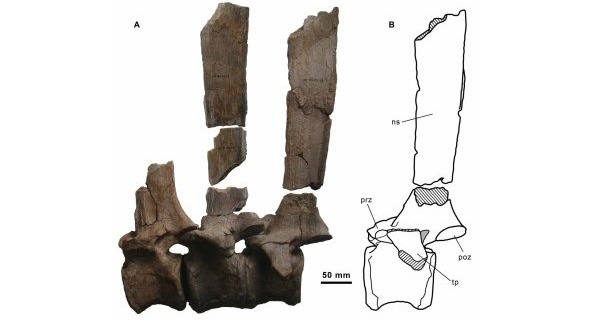 Scientists found the fossil remnants of a medium sized dinosaur, which they called Morelladon. It had four legs, likely was herbivorous, and measured roughly 20 feet in length. It was unearthed near the town of Morella, in the Castellon region of Spain. What struck researchers as bizarre was its sail-like structure made of bony spines protruding from its back about 2 feet into the air. According to paleontologist Fernando Escaso of the National University of Distance Education’s Evolutionary Biology Group in Spain, the sail was likely a tool to keep the dinosaur’s body temperature consistent. Reptiles have cold blood, and thus must keep their body temperature in line with their surrounding environment. Escaso also believes that the sail could have been used to attract mates. Structures like the one on Morelladon have been seen before, but rarely in animals that were related to each other. A similar plant eating dinosaur named Ouranosaurus existed around the same time period in Africa, but it was much larger – it weighed 7 tons and measured almost 50 feet in length. The specimen found in Spain consisted of a partial skeleton that included spines, vertebrae, pelvic bones, a femur, and a few teeth. The study’s findings were published in the journal PLOS ONE. A press release from Eurekalert describing the details of the study can be found here.